The study carried out by the MVA Consultancy was commissioned by the Caithness Partnership. The aim of the study was to identify which transport improvements best support the 20 year Vision for Caithness and North Sutherland. 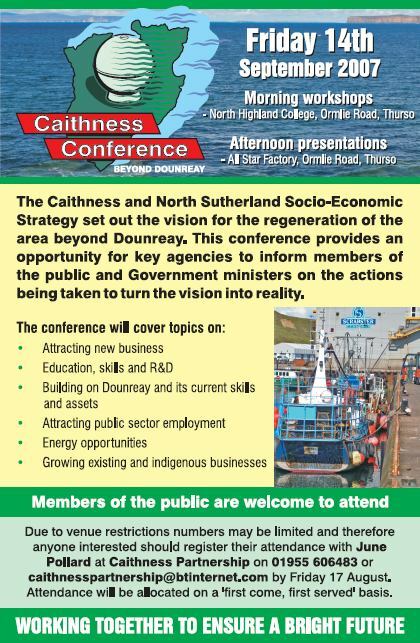 The Department of Energy, Business, and Regulatory Reform (DBRR) has confirmed that the Energy Minister, Rt Hon Malcolm Wicks MP, will attend the Caithness Conference – Beyond Dounreay, on Friday 14th of September. As Energy Minister Mr. Wicks is responsible for Dounreay and for the NDA which is currently in talks with DBRR over its budget for both decommissioning and socio-economic support. The conference is being organized by The Caithness Partnership and The Dounreay Stakeholder Group with help and support from HIE Caithness & Sutherland, North Highland College, and UKAEA. It will be held at North Highland College and will start at 9.30am. The organizing committee has put together a series of workshops from which delegates can choose followed by a full session to share feedback. The conference which will last all day has also attracted several specialist speakers to address specific regeneration issues. Invitations are being sent to all stakeholders and representatives of all interested groups and communities. In addition a number of places are being advertised to the general public and a full attendance is expected. The Caithness Partnership was asked to facilitate the setting up of a Caithness Arts Forum following the Caithness Arts seminar on “The Value of the Arts to Caithness” in December 2006 had concluded that a local forum is required where agency, business and voluntary representatives could come together with equal status and discuss issues relating to the arts in the county. In turn this should enable the Arts sector to participate fully in the community planning agenda in Caithness. Community leaders in Caithness have expressed their dismay that the county’s transport problems have been virtually disregarded in the recent draft Regional Transport Strategy. Is there someone in your community that you think should get recognition for what they do? then maybe you should nominate them for this award. Included in this issue of the Caithness Partnership eBulletin that may be useful to individuals and organisations in the county and beyond. A new fund aimed at assisting regeneration of the Pulteneytown area of Wick will help see fifteen local people trained over the next three months (October to December) in the 'Principles of Retail'. A ten week course has been set up by North Highland College with Scottish Executive Community Regeneration Funding, and targeted primarily at unemployed people living in the Pulteneytown area of Wick. Having completed the course, the students will be better equipped to gain work in the new retail developments coming to Wick - Argos, Homebase and Tesco. The course is also being supported by Jobcentre Plus. The Caithness Partnership has recently appointed a co-ordinator. More information and details about the work of the partnership will be posted here in due course. The Caithness Transport Forum is a sub-section of the Caithness Partnership. Facts and figures about Highland.